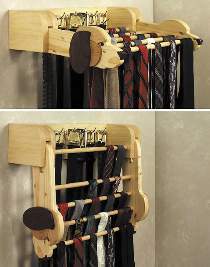 This folding rack stores dozens of neckties and belts. Swing up and push in to lock it. Every tie will be in clear view. Pull forward, and rack swings down and out of the way. Plan includes pattern for the dog head pictured, as well as a bear head and plain style side pieces not shown. Measures 18.5in.W. All patterns drawn full size. Tie and Belt Hardware. Includes 2 Plastic Eyes, 6 Hooks and 5 Birch Dowels, .5in. x 18in.